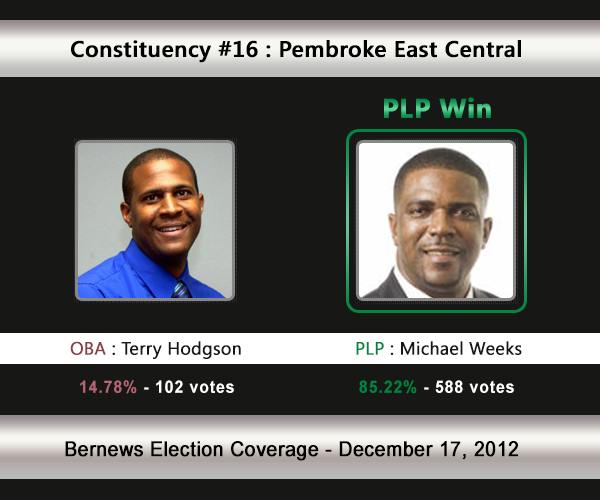 [UPDATE Dec 17: Election Results] Incumbent Michael Weeks [PLP] has retained his seat in C#16 Pembroke East Central, one of the safer PLP areas. He was challenged by Terry Hodgson [OBA]. Pembroke East Central is traditionally seen as a PLP stronghold. Michael Weeks — the incumbent — is being challenged by the OBA’s Terry Hodgson. Mr Weeks won a 2009 bye-election with 89% of the vote in 2009. In the 2007 General Election, Nelson Bascome [PLP] won 87.11% of the vote vs the UBP’s Keith Young [635-94]. In the 2003 General Election, Mr Bascome won with 91.34% of the vote against Scott Hunter [UBP] who received 8.66%. 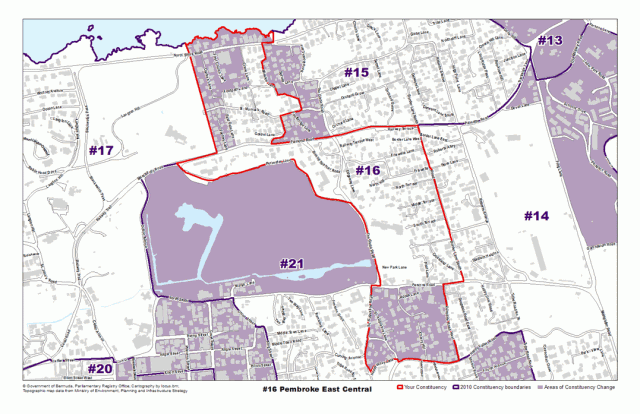 The Pembroke East Central constituency compromises of areas including, or located by: Marsh Folly Road, Crane Lane, Glebe Road, Border Lane North, Friswells Road, Parsons Road, Court Street, Angle Street and more. Michael A. Weeks is the Member of Parliament for the people of Pembroke East Central, Constituency #16, a seat he successfully contested in 2009, after the untimely death of the Hon. Nelson Bascome, JP, MP. In November 2010, he was appointed Minister Without Portfolio/Junior Minister of National Security and in 2011 was appointed as the Minister of Community Development. He currently serves as the Minister of Public Works. Mr. Weeks was born in Pembroke, Bermuda and educated at Central School (now called the Victor Scott School). He then went on to the Berkeley Institute and completed his High School education at the Fryeburg Academy in Maine. He then attended Howard University in Washington D.C., and graduated from there with a BBA in Business Administration, Majoring in Accounting and a Minor in Social Work. He served for many years in the field of Accounting, and has had nearly twenty years of service as a Residential Treatment Officer in the Residential Treatment Services division. Some of those years he served, as a supervisor and live – in house parent. Over the years, Mr. Weeks has served on a number of Government Boards, including the Housing and Planning Boards and the Pembroke Parish Council. He was also involved in a number of volunteer organizations, such as the former Chairman of the Board of C.A.R.E. Learning Center. Presently, he is the Vice President of the Western Stars Sports Club, a member of the Bermuda Leopard’s Club, member of the Berkeley Educational Society and an active member of the Kappa Alpha Psi Fraternity Incorporated. Mr. Weeks is married to Cindy, a twenty seven year veteran in education, and has three sons and a daughter. Terry Hodgson grew up in Paget, but he has strong family ties to Pembroke. He was educated entirely in Bermuda at West Pembroke Primary, Northlands Secondary, CedarBridge Academy and finally at the Bermuda College. Terry is an account executive at importers Butterfield & Vallis, where he is the buyer for a group of brands and manages customer accounts. He is a young professional who started his working life in the hospitality industry as a chef and bartender. That was an environment in which he quickly learned how to pull a diverse group of people together into a working team. Three years in the Bermuda Regiment, the last months as a full corporal, reinforced his skills as a leader. Terry says, “I’d like to see more young Bermudians actively involved in politics to generate solutions and help make the decisions that will affect Bermuda’s future. I believe I can apply the skills I learned in the Regiment to bring people together. There are a lot of artificial divisions that have complicated life in Bermuda, especially for younger people.